gel sheet layered on a soft cloth patch which offered a convenient one step process for soothing, replenishing, rejuvenating delicate skin around the eyes. Initially I was rather skeptical about using Hydro gel under Eye recovery patch because I found it too good to be true. But as I applied these eye patches on my eyes for about 30 minutes at a time (three times a week) – I was quite surprised at the results. Only after using about two to three times my eyes looked fresh and bright. Earth Therapeutics Hydro gel under Eye Earth Therapeutics Hydro gel under Eye not only reduced the puffiness and swelling around my eyes but also smoothened and conditioned my skin reducing fine lines and wrinkles thus making my skin look younger and beautiful. I was greatly pleased with the results and thanked my sister profusely for helping me solve my problem successfully. eye recovery patches were quite handy and made it easy to carry them anywhere I felt that I would need them. 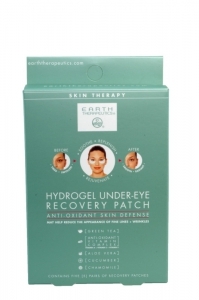 Priced at $8.49 – (for 5 pairs) Earth Therapeutics Hydro gels under eye recovery patches according to me are perhaps the best solution for your tired and swollen eyes. These eye recovery patches promise to make to make your skin look as good as it feels- nurtured and nourished- smooth and radiant. Indeed a great eye care product for those beautiful looking eyes.